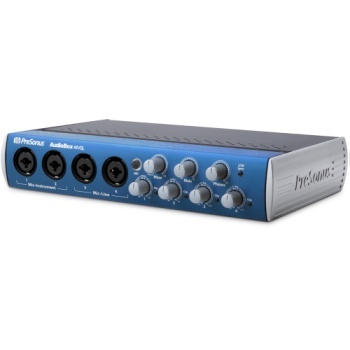 The AudioBox 44VSL is the second model in a new generation of PreSonus USB 2.0 audio/MIDI interfaces that take hardware/software integration to the logical next step. Using your computer CPU and PreSonus Virtual StudioLive (VSL) software, AudioBox VSL-series interfaces provide reverb and delay effects and the same Fat Channel compression, limiting, semi-parametric EQ, and high-pass filter, as the PreSonus StudioLiveTM 16.0.2 digital mixers all with inaudible latency. Furthermore, thanks to the power of VSL, the AudioBox 44VSL includes an 8x4 software mixer. As a result, with just an AudioBox 44VSL and your laptop or other computer running VSL, you can mix a studio session or a live show featuring, say, a guitar duo with vocals, a small band, a DJ rig with mixer and stereo synthesizer, or a panel discussion all while monitoring and recording with or without real-time effects! And you can do it simply and easily, with no hardware mixer, no outboard effects rack, and minimal wiring, thanks to the tight integration between PreSonus hardware and software.